After a run of 12 wins stretching back to October, it was unlucky 13 for the Blues Academy away at Loughborough University on Saturday. With Loughborough University Freshers playing England Counties U18 in a training game, the Blues faced older students who were two or three years older than them. This should give us some good lessons for the future. 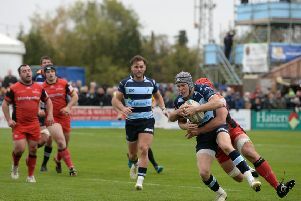 The Blues took a narrow but deserved 10-8 lead in at half-time, but their performance levels dropped off in the second half as they went down to a 32-10 defeat. Loughborough took the lead after 10 minutes with a penalty from centre Will Bishop, and they extended this 10 minutes later with a try from ex-Blues Academy second row, Seb Clarke. But Bedford began to exert control up front, with the Blues front row getting on top of their older opponents. It was a strong scrum that led to the Blues’ first score, with a break from number 8 Zach Scott-Gray feeding scrum-half Dylan Leney who put winger Luke Hibberd in for a try in the corner. And Bedford took the lead just before half-time with a try from flanker Callum Strachan which put them 10-8 up at the interval. The second half was a different affair, however, with the physicality of the older students beginning to tell. Loughborough scored from a well-executed lineout drive to go 13-10 ahead after 10 minutes. A few minutes later a kick out of defence by the Blues was well taken on halfway by the students’ full -ack, who took a good line to beat the Bedford defence to score. With changes made in the Blues pack Loughborough began to get some parity in the set scrum, and were rewarded with a push over try, and conversion by Bishop, to go 25-10 ahead. The students then finished off a good half for them with a converted try to make the final score 32-10. Bedford Academy director Denis Ormesher said: “We did well in the first half with our set scrum putting the students under pressure. “We coped well with the physicality of the older students in the contact zone well, and deserved the narrow lead at half time.